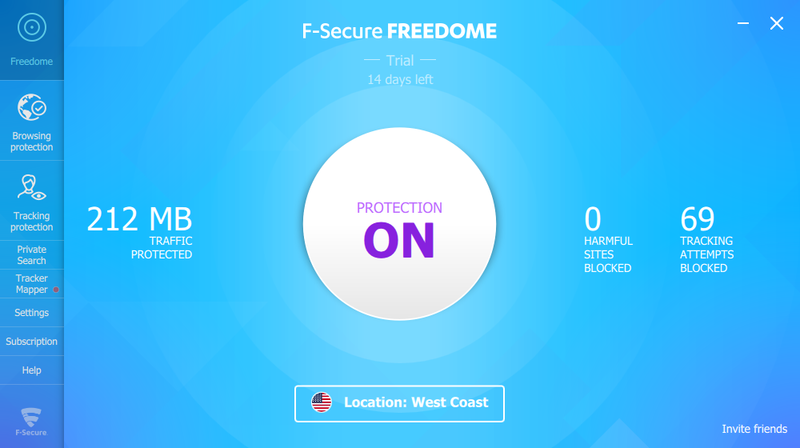 F-Secure FREEDOME VPN is an easy-to-use tool which preserves your privacy online. The program is ridiculously easy to set up. There's no reboot after installation, no network options to consider, no account to create, no registration, login or anything else. Just click the big button and within seconds you're securely connected to FREEDOME's VPN. Go browsing now and websites won't recognise you. Advertisers can't track you. Encryption means your data is protected, even when using unsecured wi-fi hotspots. Maybe you're tired of being told web content "isn't available in your country"? Choose one of 26 virtual locations at any time - America, Canada, Japan, Hong Kong, Singapore, Belgium, Denmark, Finland, France, Germany, Italy, Norway, Poland, Spain, Sweden, Switzerland, the Netherlands, United Kingdom, Australia, Mexico, more - and sites will treat you like a local. An integrated web search tool won't compromise your privacy by storing your search terms and IP address, or using cookies. Unlike, well, just about everybody else. An optional "tracker mapper" displays a real-time visual map showing which sites are making attempts to track you. All this worked quickly in our tests, no performance issues at all, and if you do decide to subscribe then it's also very easy. There's no need to compare multiple plans with different service levels or speeds: just select the number of number of devices to protect, your preferred subscription length, and you're done.